It was Otto von Bismarck who as Chancellor of a unified Germany introduced old-age pension legislation that would allow workers to retire at age 65. I have no idea why 65, though the cynical point out that the average Prussian life expectancy was 45. Nevertheless, 65 has become a kind of mystical number; the mere mention of “early retirement” or “freedom 55” seems decadent, the words providing a glossy patina to the suggestion that you could cheat the system, as if it were a kind of tax evasion. A tip of the hat to those who could pull it off. So now that The Fiddlehead has hit the magic number it can move to Florida and luxuriate in the exotic ferns of that florid climate. I imagine the “Staghorn” knows how to fiddle a tune or two. And I’m intrigued by the floating ferns that drift about on the water. There’s something poetic in that. Perhaps it’s fitting that The Fiddlehead is Canada’s oldest journal. In the fossil records ferns show up 400 million years ago, some of the oldest forms of plant life on earth. So here’s to the old Fern. Put on your favourite fiddle music, draw a fine ale with a good head, and raise a glass with us. Not in Florida, but rooted right here in New Brunswick. This, in our 65th year, is the summer special poetry issue. We have so much to offer you again this summer, and I’d like to start by celebrating our relatively new poets. One string on our fiddle is always tuned to their work. Pay close attention to the remarkable writing of Danielle Devereaux, Erin Knight, April Ripley, Nick Thran, and Stephanie Yorke. We’re also casting a glance backward to past editors and contributors Robert Gibbs, Don McKay, and Travis Lane. Bob’s name is almost as entwined with The Fiddlehead as Fred Cogswell’s. He was editor from 1971-73, acting editor several times, and worked as the poetry editor for over forty years. He wrote the brief Fiddlehead history for the 50th anniversary issue, known as Fiddlehead Gold. Don McKay edited The Fiddlehead from 1991-1996 and introduced a new generation of poets to Canadian readers. I have spoken to many of those poets about Don’s influence, and they all speak of his generosity of spirit. Travis Lane is one of those few poets dedicated to reading poetry with such close critical attention that it leads to extensive and perspicacious reviewing. Someday I will have to count the astonishing number of reviews she’s written for The Fiddlehead. In this issue you will find her latest. This year we present two retrospectives of renowned American poets Jorie Graham and Marvin Bell, introducing them to Canadian readers unfamiliar with their work and reminding those who know them of the remarkable contributions they have made to twentieth-century poetry. Sharon McCartney (For and Against 2010) and I selected the poems of Marvin Bell, and Katia Grubisic (What if red ran out 2008) and I worked on Jorie Graham’s poetry. I cannot really convey how much I enjoyed rereading Graham and Bell’s books and having long, leisurely conversations about them with Sharon and Katia. Thank you, Katia, for your work on the interview with Jorie Graham and you, Sharon, for your insightful introduction to Marvin Bell. We can never pretend to represent the entirety of Canadian poetry in our summer issue. Such a task would require at least twenty volumes. We cannot even pretend this is a cross-section; it is, rather, a sampling of some very fine poets. 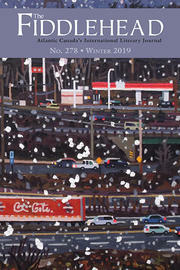 Summer issues alternate between poetry and fiction, and each year after the special fiction issue is published I start to get excited about the summer poetry issue to follow. I begin to gather work I think will be at home there. And speaking of the fiction issue, yesterday I passed the torch to Mark Jarman to begin assembling next summer’s issue. Mark has been fiction editor since 1999, and his sensibility and his ear for the truly unique and surprising voice has shaped The Fiddlehead into the journal to turn to when looking for the genuinely new and fresh in Canadian fiction. 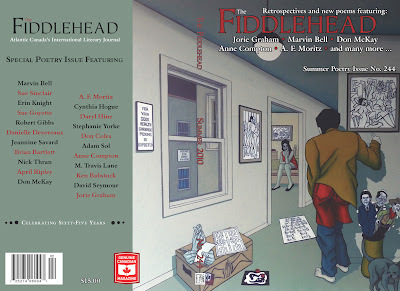 This is the opportune moment to thank The Fiddlehead poetry editors, Jesse Ferguson and James Langer, whose help has been instrumental in assembling and shaping this issue. They are both interesting and careful readers, and they are fine poets. Readers of poetry should explore Jesse’s Harmonics and James’s Gun Dogs. It is also the moment to thank our book reviews editor Sabine Campbell. Her love of Canadian literature inspires her to commission excellent reviews of new books, and she edited the poetry review section of this issue with a keen intelligence. It is gratifying to hear from readers looking for copies of previous poetry issues. Thank you, our readers, whether you are younger or older than 65.